Location: Bouvron, in the Loire-Atlantique departement of France (Pays de la Loire Region). Notes: Château de Quéhillac is located in the municipality of Bouvron in the department of Loire-Atlantique in Pays de la Loire, France. outstanding architectural ensemble of the sixteenth and seventeenth century, composed of the castle of St. Matthew chapel, the house chaplain, stables, the leak, bridges and moats. The set is on the list of the Historic buildings since 22 November 2002. Jean Fourché (v1556-v1612), large archdeacon of the church of Nantes, to master the Accounting Chamber (1590), the future mayor of Nantes (1597 - 1 May 1598), with the acquisition of the land Quéhillac in 1595, became the lord. In 1640, Nicolas Fouquet, Louis XIV's finances first wife Louise Fourché of Quéhillac, granddaughter of John Fourché (above) who brings him 160,000 pounds of dowry and land Quéhillac. This land will return to the family Fourché the redemption that will cousin by marriage of Nicolas Fouquet, Jean Fourché, counselor to the king in his councils, and trustee Attorney General of the States of Britain (v1617-1675). 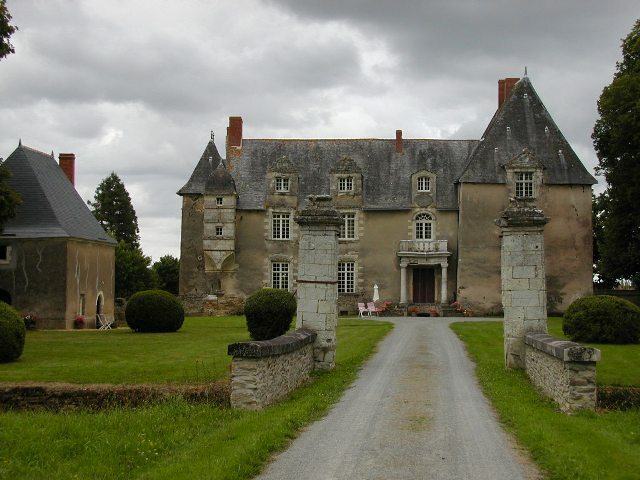 Jean Fourché died without issue, but Quéhillac is currently still owned by descendants of the heirs, the counts of the Gentile Rosmorduc - Breton house of chivalrous extraction - from Logonna-Daoulas (Finistère).